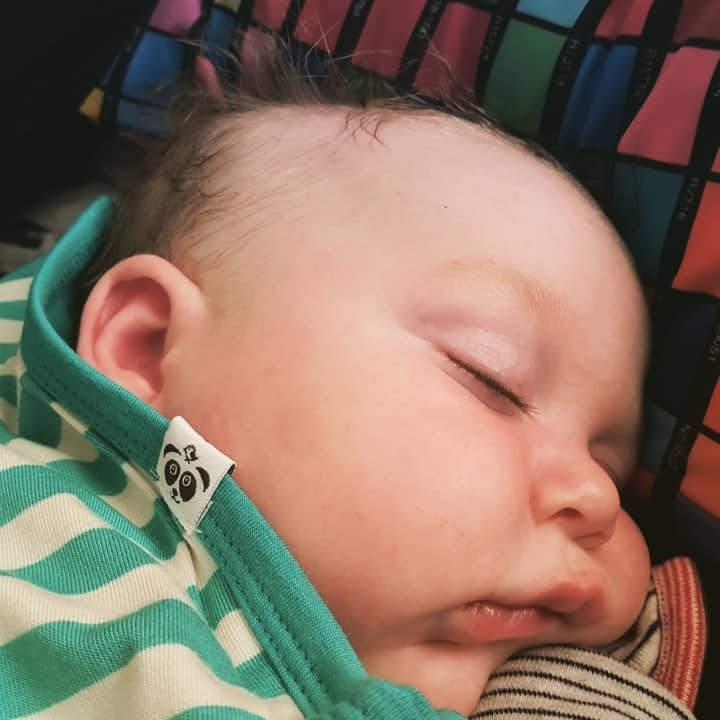 Panda and the Sparrow make gorgeous baby clothes from bamboo, meaning they are heat regulating (keeping baby cool in summer and warm in winter) plus Bamboo also offers a natural UV protection, and is hypoallergenic. Most importantly their clothes and blankets are just so cosy for babies! Arlo has been keeping cosy in the sleepsuit and hat, under the matching blanket. There is nothing cuter than a baby in a knotted hat, and when that hat is a stripey one then even better… it makes them look like little convicts (yep, I know that’s a weird thing to say but it’s true! Or perhaps I watch too many old prison break movies?) But his little tuft of hair sticking out at the front is just too sweet! 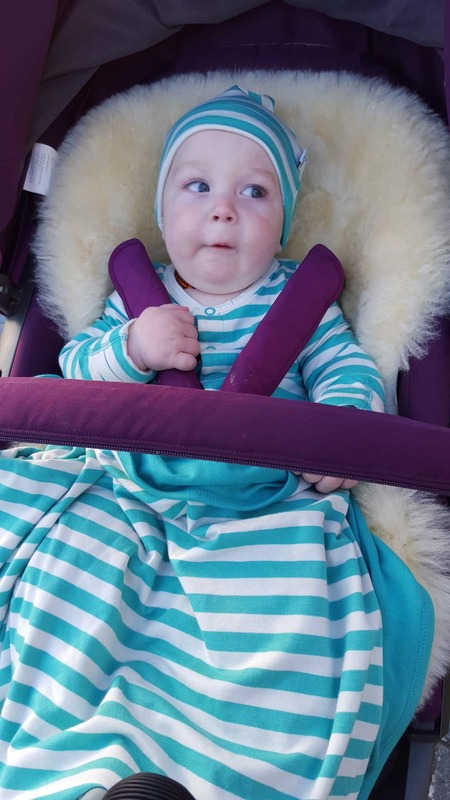 The sleepsuit is superbly designed, poppers down the front and one leg for easy access, and both the legs and sleeves have fold over cuffs so you can cover up little hands and feet when out and about for extra warmth, or to stop little babies scratching themselves! Because the material is so stretchy this doesn’t mean the sleeves or legs are pulled tight either when the ends are pulled over. When Arlo was ill last week rubbing his back was a delight when the material is so soft, and it’s stayed as soft even after washing too! The matching hat is just cuter than cute, really stretchy (it fits Athena too, she wanted ‘my go!’ when she saw it!) and the edge can be turned up or down over the ears for wind protection, so perfect when Arlo is in the carrier and no chance of it popping off of its own accord! The double sided blanket (stripes on one side and block colour on the reverse) is again super stretchy so can be tucked around little wriggly legs and feet easily, we’ve been using it in the car once Arlo is buckled in and despite all his leg kicking it’s stayed put and kept him snug and warm as the weather gets colder. It’s also come in very handy when he’s in the buggy at the park, he’s nice and warm whilst I’m hurtling around after Athena! The little logo is adorable, and is available on tops and PJ sets too! Have a look at the full range. Find Panda and the Sparrow on twitter, facebook and instagram. Awh. Lovely stuff. He looks so cosy in his buggy. I love P&S. We’re hoping to get T a suit for Christmas as we love the cuff and ankle feature where you can open or close the cuff/feet (perfect for lengthy babies like T!). Plus, the simple design is beautiful (and reasonably priced!). Lovely photos! Little cutie. Aww he does look adorable! I was thinking elf rather than convict but snug and stripy all the same! We could not be bigger Panda & the Sparrow fans! Absolutely love all their clothes. Awww! So cute! he looks like a little Elf. I love it. Looks lovely and soft too. Stripes are always in.